The Salinas City Center Improvement Association (SCCIA) Board of Directors announced the addition of three new members at their April 4th board meeting. Larry Bussard, Cheri Hitchcock and Kevin Saunders will be joining the current board of directors in contributing their time, energy, talent, and leadership towards the revitalization of Downtown Salinas. Concurrently, Jeff LaTourette is resigning from the board due to his current workload. “We thank Jeff for his service, and will gladly welcome him back when his other obligations allow.” Said Catherine Kobrinsky Evans, President of the SCCIA Board. Moving forward the SCCIA is pleased to work with their newest members and feels that having such qualified candidates join the board will benefit their overall mission towards the revitalization, improvement and beautification for Downtown Salinas. “We are motivated to keep the momentum going and we look forward to the fresh ideas our three new board members will bring.” Said Meryl Rasmussen, Board Member and Cochairman of the DISI Committee for SCCIA. Meet the newest Salinas City Center Improvement Association Board Members. Larry oversaw several projects while serving as the Director of the City of Salinas Redevelopment Department for 23 years including a $35 million investment in our downtown. Projects undertaken include over 30 seismic retrofits, redevelopment of the 100 block of Main Street, purchase of the train station, launch of the Intermodal Transportation Center project, the translocation of the First Mayors House, the development of the National Steinbeck Center, the development of the Maya Cinema & the Monterey Street parking structure, and the Downtown Vibrancy Plan. In addition to owning a property in the downtown district, Cheri is also a District employee and customer with deep roots in Downtown Salinas. Her great grandparents were early settlers in Salinas. F.N. Hitchcock owned a drugstore in the 200 Block of Main Street, and Ross Nissen farmed on land near South Main Street and Nissen Road. The 356 Main St. property has been in her family since the 1930’s. Cheri is employed with Growers Express as an Assistant Controller, and has been with the company since 2003. Kevin Saunders has been employed by California State University Monterey Bay since its inception in 1995. Mr. Saunders serves as the Vice President of Administration and Finance and Chief Financial Officer. He directs a wide range of campus departments that provide essential services to students, faculty, staff and the external community. He has direct oversight of finance, facilities services and operations, campus planning and development, and public safety. In addition to his role as Vice President, Mr. Saunders is the Executive Director of the University Corporation at Monterey Bay, a 501c(3) that manages housing, dining, bookstore and other enterprise activities. The Salinas City Center Improvement Association is a California Nonprofit Public Benefit Corporation established in 2016 by downtown property owners to play a leadership role in the revitalization of the Downtown Salinas area. 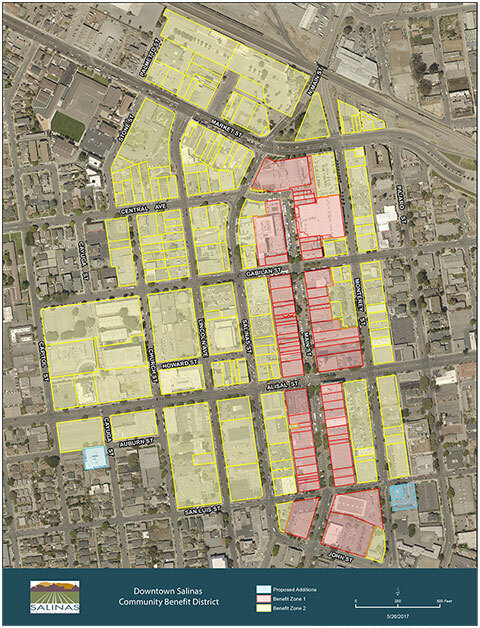 Among its interests are the Salinas Downtown Vibrancy Plan, enacted by the Salinas City Council in 2014 to restore activity, commerce and vitality to downtown Salinas. The SCCIA Board of Directors for 2018 includes these downtown Salinas volunteer leaders: Catherine Kobrinsky Evans (President), Frank Saunders (Vice President), Margaret D’Arrigo Martin (Secretary), Brian Finegan (Treasurer), Fred DeYoung, Gaylon Haney, Peter Kasavan, Joel Panzer, Greg Piini, Meryl Rasmussen, Larry Bussard, Cheri Hitchcock, Kevin Saunders.